This is one of 14 updates about my 2014 challenge to complete an Ironman – you can see a list of the others here. I have now completed five months of my nine month Ironman training plan. 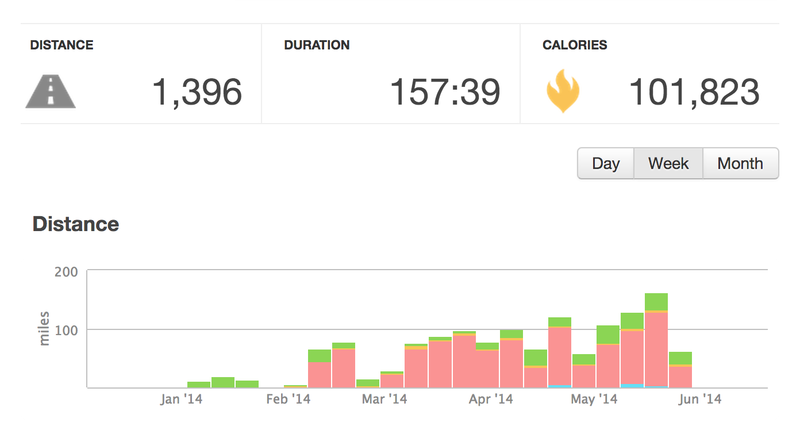 Next week I finish with my base period, hit my max mileage… and then the hard work starts. I am training based on a custom plan that I designed. In this post I’ll share my philosophy and workout plan. But first a training update. May has been a solid month and last week was one of my best weeks of training yet. In the past seven days I’ve hit new distance records in all three events: 2.5 mile swim, 92 mile bike and 15 mile run. I have also taken steps to work on all of my weak areas that I discovered at my training race – detailed here. I have run repeats to work on my ability to dig deep, hills to work on my climbing power & both of my last long bike rides have included a run afterwards to help my ability to transition. I’m feeling pretty good about my progress right now. I designed my own training plan for my Ironman. I did this for two reasons. First, it allows me to customize my training to my own goals, strengths & limitations. For example I can take into account my bad knees, flexible work schedule, tons of running experience and limited time to train (on account of having a newborn & lot of responsibility at work). Second, it is super interesting to me. Designing a training plan required filling my head with tons of knowledge about the sport as well as different approaches to training for it. By learning a few different philosophies and researching the criticisms and strengths of each, I was able to form my own unique philosophy, drawing from the experience of others. I got started by doing a ton of reading. 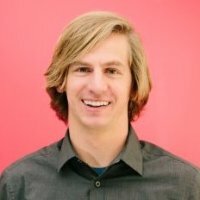 The first place I looked was online – I trolled every triathlon website and forum out there and found answers to most of my beginner questions. This was also particularly helpful when deciding on new gear I needed like my bike. I then worked my way to books. Finally I printed a few different stock training plans that I could digest to understand what those philosophies looked like in practice. The nice part about this was that I had plenty of time to learn & decide while I built up a base. I knew that my training plan would really affect the second half of my season, the first half was just going to involve doing a little bit more every week to build my fitness. Lets recall that I was basically starting from ground zero, my first run in January was two miles long. 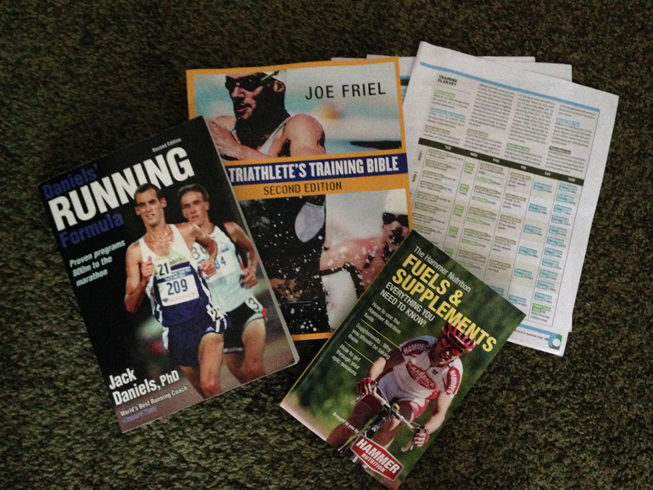 The main books I drew from were Joe Friel’s Triathlete’s Training Bible and Jack Daniels’ (not the Whiskey one) Running Formula. I had used Jack Daniel’s book as the training basis for past running seasons, so I knew that I tended to benefit from it. Friel has a similar philosophy in regards to how to build a season, but offers a lot of sport specific advice. I then had a few decisions to make. Decision 1: How do I keep track of mileage across multiple sports? I come from a running background, so I am used to keeping a log of how much I run every day. Usually my log would consist of a simple number of the total distance run and quick shorthand note if I did some sort of quality work like a tempo run or hill repeats. I usually stuck with the rule of never increasing more than 10% over the previous week and making sure to sprinkle in rest weeks every month or so. This worked fine in January when all I did was run, but come February, I got a bike and the public pool opened for the year and I realized I had a problem. The miles weren’t the same – they required different amounts of effort so I couldn’t just sum them. I first though about keeping three totals and increasing each by 10% per week, but when I sprained my ankle and decided to stay off of my foot for a bit, that system broke down. I realized I needed a way to normalize the miles so that if one week was a little bike heavy, I could still compare it to the previous week that might have been swim heavy. I decided to normalize everything to running, because that is what I knew. I would keep track of actual mileage, but for mileage planning purposes, I would also have a normalized number to work with. Since I could swim one mile in ~35 minutes and in the same time I could run five miles, I decided to multiply all swimming miles by five to get my normalized mileage. So a two mile swim counted as 10 normalized miles. Running I kept as is, because that was the normalizing factor. So a 10 mile run counted for 10 normalized miles. Biking was really difficult for me because I realized that with hills, I was only biking about twice as much in an hour as what I could run. At the same time, the bike part of the Ironman was 4X the mileage of the run part. I figured my conversion should be somewhere between 2-4 and landed on 2.5. So after each bike ride, I divided my mileage by 2.5 to get my normalized mileage. So a 25 mile bike ride counted as 10 normalized miles. This worked for a while until I became proficient at biking. After I got over the initial learning curve I realized that biking was by far the easiest way to log miles and that I could get 40%+ of my weekly total in during a single ride. To combat that a bit I changed my bike conversion divisor to 3. So now a 30 mile bike ride counts as 10 normalized miles. I did find a bit of data that supported the calorie comparison between biking & running, at the speed I biked at, was about 3:1. At this point in the season I realize that the conversions are highly subjective. If anyone else ever tried this, I would recommend picking a conversion based on your strengths and weaknesses along with the distances you’re racing. For and Ironman I would think most people would have a swim ratio between 4:1 – 6:1, running of 1:1 and biking between 1:3 – 1:5. I like this plan in general because it gives me a way to compare this week to last week and to adjust my weeks based on what sport I am able to get in. I’ve found that while traveling, running is the easiest to do, and so I’m glad that I have a way to figure out what I need to run to substitute my bike ride on a particular day. Decision 2: How much should I train at each of the three sports? I am trying to maintain a ratio somewhat similar to the race distance of the Ironman. Using my conversion numbers that is: 16% swimming, 49% biking & 35% running. If you looked at the Ironman race strictly by time the swim would only be ~10% while the bike might be closer to 60%. I’m ok with my numbers though because swimming is my weakest sport. I am actually biking less than I intended but that is mainly because biking takes the most time to get a workout in. During the week when I’m time crunched, running is a much more efficient way to get my miles in, so I’ve been skewing towards that. You can see in the example below that my weekly percentage bounces a bit. At the beginning of the season, before I had a bike and pool to swim at, I was running a lot more. Later on you can see that I kept my running mileage a bit low as I recovered from an ankle injury but am now brining it back up. As long as in the long run everything evens out a bit I think I’m fine. If there were ever too many weeks without one color, I’d be concerned. Decision 3: How should I build my mileage over the season? I decided to stick with a system that has worked for me in the past. The plan basically has three major sections. First is the base in which you build mileage and a bit of intensity. Then there is the heart of training where you hold your mileage or drop it slightly while increasing intensity. Finally a peak where mileage and intensity drop, thus allowing your body to rest for the big race. The chart below shows my planned weekly mileage and relative intensity level throughout my season. This represents the 37 weeks between January 1st and September 21st, the day of Ironman Lake Tahoe. You’ll note that every fourth week there is a rest week where I run fewer miles and have low intensity. That is to help prevent injury, both physical and metal. Those break weeks give you a chance to catch up on sleep, rest up that sore muscle that had barely been able to keep up with the last few workouts and to spend time with the people your training had taken you away from. You can also see that no week is that much harder than the week preceding it (excluding rest weeks). Even though the first week of training I only ran 2-3 miles per day, by the time I peak, I will have slowly but surely increased to the point where I can complete the 140.6 Ironman race. The hardest decision here was when to finish with my base phase. Some Ironman plans, that are designed strictly to help someone finish, simply increase mileage until the shortly before the race, then allow for a few weeks of rest. In contrast, when I used to run track in college, my base phase would be much shorter because I was usually entering it with decent mileage from cross country season. I would add base for two months and then have three to four months of intense training. Additionally, because the race was shorter, the intensity was even higher. Some days I would be training at speeds 50-80% faster than my easy pace. In contrast, for the Ironman, because the race is so long, my race pace is only 10-20% faster than my easy pace. Due to my rule of only increasing 10% per week, the longer I had in the base phase, the higher my total normalized mileage would get. If I cut it short, I might not be prepared for the length of the race. But if I spent too much time building base, I might not have enough speed to compete at the level of my goal – qualifying for the World Championships. I ultimately decided that getting above 100 normalized miles was good enough. That would put my long bike ride at over 100 miles and my long run above 20. That would be close enough if I also had a strong lactic threshold. Doing the conversion math, that puts my peak week at around: 3.5 miles of swimming, 150 miles of biking and 36 miles of running. Decision 4: How much & what type of quality work should I do? I mentioned above that as the season progressed I would add intensity. The two ways to do this are selecting higher intensity workouts for quality days and to add more quality days each week. I decided to do a bit of both. I started by adding one quality day per week to my Base 2 phase and I slowly built up to 3 by the time I was in Base 5. For all of the Build phase I will have four quality workouts per week. Along with this my long days have become much more intense. During the initial months, every day I had a similar workout, 2-3 miles of running each day for the first week. At the peak of intensity however, long days will end up being ~3X that of a normal day. So while an easy day might be an 8 mile run, my long day will be 24. As for intensity, there are basically four tiers of intensity when it comes to workouts. They can be mapped to heart rate if you train with a heart rate monitor or they can be mapped to speed if you know your current max. Tier 1: Easy – basically the pace you can go crank a ton of miles at. This is the pace for any non-quality days as well as long days. Tier 2: Threshold – a pace that is more intense but that you can sustain for ~1/2 your daily mileage, but that starts to hurt. Workouts in this zone include Tempo runs & cruise intervals. Tier 3: Interval – a pace you can sustain for moderate size chunks, but that you’ll need to catch your breath for a second before doing another if you’re going to complete the whole workout. Mile repeats running, 5 minute bursts biking at 1,000m swims all fit into this category. Rest between them is usually about equal to the time it took to complete it. Tier 4: Repeats – a pace where you are near your max speed – by the end you are out of breath and need to recover. Hill sprints & 50m swim sprints fit here. The shorter your race the more time you’ll want to spend at the higher tiers. An olympic sprinter spends a lot of time doing tier 4 work. Your average marathon runner might not ever do anything in tier 3. I decided to spend most of my season in tier 2, due to the length of the Ironman race. By the peak of intensity I will, however, have one of four quality workouts per week in tier 3. 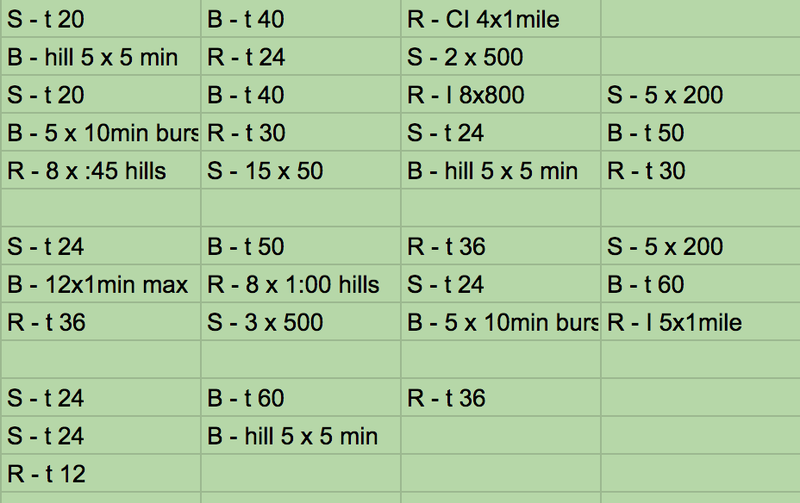 I’ve also sprinkled in a limited few tier 4 workouts into my season, mainly to work on strength & power for very specific things like getting up hills on the run and starting strong in the swim. Tier 2, work is great when training for long races because it helps increase the amount of time you can run at a pace faster than your normal easy pace without accumulating lactic acid – the stuff that makes you feel sore and stiff. To do this, you at a pace just near or above where your body starts to accumulate lactic acid. By increasing the length of this workout each week, I am increasing my body’s ability to perform efficiently without building up too much lactic acid for a long period of time. Here are some upcoming workouts I have. You can see that I use shorthand to designate tempo workouts of X length (t X), which make up a majority of my training. I do try to mix it up a good bit though, sometimes doing the same thing gets boring which is why I’ll sprinkle in some cruise intervals or a session of 5 minutes easy – 5 minutes hard. Decision 4: What pace do I complete my workouts at? Now that I know what quality workouts I will be completing each week, I have to determine the pace. I use a pace chart and a number called a VDOT to determine my pace. This is an item from Daniels’ running book. Basically VDOT is a representation of your body’s ability to process oxygen and deliver it to muscles so they can perform. The higher a persons VDOT is, the faster the person will be able to race. Daniels’ book has some tables that help you figure out certain paces based on your VDOT. Those paces include an easy run pace, threshold pace, interval pace & repeat pace. You’ll notice those match my four tiers of intensity above. How do you determine your VDOT? The most accurate way is to go to a laboratory where they hook you up to a bunch of equipment and make you run on a treadmill. The simple way is to run a race and use that as your max speed on the conversion table. I go with the simple route. In order to make sure my VDOT is up to date I scheduled a few practice races throughout my season. I will also periodically bump it up if certain workouts start to feel too easy. This is important so that as my fitness improves, the workouts still stretch me. In order to avoid plateauing you have to keep pushing yourself. So each day, as I go into my workout, I can check the table to find my target pace for that particular workout. Because the table only includes the ranges of 10 minutes to 4 minutes per mile I need to do some conversion for swimming & biking. My swim is slower than that and my bike is faster than that, so I use multipliers to get inside the included range. It all tracks back to a max speed for a particular distance raced, so the multiple I use doesn’t matter that much. Decision 5: How do I fit all of that into a week? Now that I have decided how many miles to complete each week and what quality workouts I need to do, I have the task of planning my week. This part is more art than science. I use a template of the week that includes each day and the three sports and start a trial and error process. I make note of what days I plan to do quality work by adding an X.
I aim for a few things. The first is that I have spread my quality days out throughout the week. Too many in a row is tough on the body. I then make sure I’m rotating between the sports. I don’t want to do 3 running days in a row & burn out my legs. I also check what the weekly total ends up being to make sure I’m within my target ranges, or if I’m not, that I at least know why. Finally I try and make sure my weekend mileage isn’t more than 50% of the total weekly mileage. It might seem crazy that in two days I do as much work as the preceding 5, but that just ends up working out best because it is only on the weekends that I have enough time to complete my long bike rides or two a days. I then cross reference this with a few things to make final adjustments. How does my work calendar look for the week, what days can I fit a run in during the middle of the day, what days can I start & finish later so that I can work out in the morning. Decision 6: How am I preparing for fueling during my race? Triathlons have three events: running, biking & swimming. Ironman races, however, have four. The final one is fueling. With race times ranging from 9-17 hours, if you don’t consume enough calories of the right type, your body will stop working and you will not finish the race. Fortunately, there are plenty of options. Unfortunately, there are a lot of options. My fueling strategy during training has been to figure out what works best for me so that I can prepare for race day. 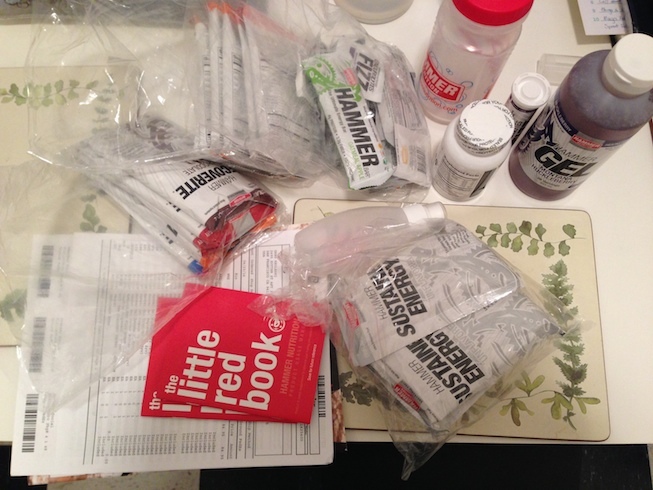 I started off by sampling a ton of products – I bought single servings of ~20 different bars, gels & powders. From there I narrowed it down some and have been testing my nutrition on my long rides. The trouble with most workouts is that they are too short to really test fuel. Even my long runs are only 2 hours right now which I can do without food or water. My long bike rides, now >6 hours are the best way to push things to the limit. I started testing by letting myself bonk on one ride. Bonking, for those of you not familiar with the lingo, is a term for when your body crashes because it ran out of some sort of fuel. After having done that I had a base line and could start experimenting with other products. At first I tried a lot of bars & gels but realized that those are a lot of work to eat and can get kind of messy if you’re not eating them all at once. I’ve ended up landing on liquid nutrition, specifically from Hammer Nutrition. I like that it uses natural ingredients and the flavors are more subtle. Some of the sugary products like GU & gatorade made me want to puke as I tried to eat them while climbing a hill. Hammer Gel & Perpetuem on the other hand have been great. Here is the sample pack I got from them to try out various products & flavors. I might share more about where I’ve landed later, but the important thing here is that I’m using training as a way to figure out what works for me so that there are no surprises during my race. The one thing I need to work a bit more on is eating more than I feel like I need on the bike. The trouble with training rides is that I can coast home on fumes and recover once I’m done. During the race, once I get off the bike I’ll have 3-4 more hours of racing to go. I need to make sure I’m not finishing the bike on empty, especially because fuel is much easier to consume while biking than while running. You could describe my race fueling strategy as: swim using breakfast’s energy, get on the bike & start eating + drinking, go into the run in good shape and have a few things as needed, finish on empty and recover for the next month. Decision 7: What other specific things do I need to focus on? Along with building fitness, there are certain elements about racing an Ironman that are new to me and that I’ll need to prepare for. I’ve competed in so many running races that I can go on autopilot on race day and focus all of my energy on racing. The same is not true of triathlons. Nor is the same true of any long race really, my typical race was between 5-10K, so it only lasted between 15-34 minutes. The following are some specific items I’ve worked into my training. This part is completely new to me. To get familiar with it I watched some YouTube videos and then went out and practiced a few times. Along with dry-run practice I also worked a few into my workouts so I could see what it was like to do it while tired. Finally I competed in the Wildflower Triathlon where I got to practice in real race conditions. I ended up doing really well at transitioning, in the top 90% of participants, so I’m not too worried anymore. The longer the race, the less impactful the transitions are, so I consider this box checked. I’ve never done much of this and most of my swim training is in the pool because of convenience. Open water is much different. It is choppy, requires a wetsuit (at least for my race), there is sun in your eyes & you have no lines at the bottom to guide you. To help become familiar with open water swimming I try and get an open water swim in at least once a month. Usually at the Aquatic Park here in San Francisco. I’ve also signed up for a number of open water swim races detailed below. The most challenging part of the swim for me will be the contact. In my normal daily life I don’t get kicked in the face much, so it is a bit shocking when that happens during a race. To get used to it I’ve signed up for a few swim races as mentioned above. Those include the Wildflower Olympic Distance Triathlon, a swim from Alcatraz island to San Francisco & a one mile lake Tahoe swim. My training rides are mostly individual so I am not used to riding near other people. The good news about the Ironman race is you aren’t allowed to draft, so I don’t have to learn to do that. The flip side of that is that I have to get really familiar with the rules so that I don’t accidentally draft anyone. There is a specific distance you have to stay behind someone and even a specific way to overtake them. To get familiar with this I have both the Wildflower Triathlon and I local century ride. On training rides I take everything I need with me and periodically stop to refill water. This is fine for training where extra wait is just extra practice. During a race I need to be more efficient. I learned this at the Wildflower Triathlon where I carried way too much water with me. In order to get more familiar, I’ll be doing a century ride soon and I’ll be doing it lean. I plan on bringing only my nutrition and depending on water stops to refill. That should help me practice planning my race, calculating my water needs and executing a lean racing strategy. The nice thing about 5Ks & 10Ks is how short they are. If you’re too cold, it is only half an hour then you’ll be done. Additionally, since the race is so short, the weather probably won’t change dramatically from start to finish. In the Ironman however you have more to deal with. If it is a cold day and you’re not dressed properly, you can really zap your energy. If it starts warm and rain clouds come in, and you don’t have a contingency plan, you can ruin your race. To help with this the race lets you prepare an special needs bag that they put at the half way point of the run. You can also have extra gear at your transition station in case you decide you need it. My plan here is to get comfortable in a wide range of conditions during training and figure out what gear I need for what type of day. I then plan strategically placing items in my transition and special needs bag so I know what options I have. I have a few of most things, so I might double up. For example having a long shirt at T1 & in my run special needs bag. I also plan on having extra fuel tucked away, a few salt pills in my running water bottle’s zipper pouch & extra protein & carbs in the run special needs bag. The Ironman race can take between 10-17 hours to complete. You’ll have to go. For most people stopping at a port-o-john or tree on the side of the road is the best option. I’m competing for an age group stop and don’t want to waste time with stopping. I have practiced the alternative. Enough said. The Lake Tahoe Ironman takes place at an elevation of 6K ft+. At that altitude there is less oxygen and performance is decreased. The good news is that this affects everyone. To prepare for this I am doing two things. The first is that I am training & racing at altitude a handful of times so that I get familiar with it. I want to know how my body reacts so I can adjust my goal times accordingly. The worst thing I could do would be to treat it like it wasn’t altitude & go out too fast, then crash half way through. The second thing I am doing is trying to spend as much time at altitude as possible so I acclimate. Along with training & racing a few times this summer I’ll be getting to Tahoe a week before the race to acclimate. They say for altitude races you should either get there a week in advance or the morning of – one to two days before the race is the worst time to arrive. I’m hoping my strategy will give me a slight edge over most of the competition, though any natives of Lake Tahoe will certainly have the greatest advantage.